This class covers beading these sparkling components which unite peyote stitch components with Swarovski Chatons & bicones for dramatic and versatile necklaces and bracelets. Ideal for anyone who knows basic peyote stitch, all pieces can be adapted in width to suit your own tastes and preferences. Using beading elastic as its base the finished piece requires no clasp and makes it ideal for different sizes and wearers. 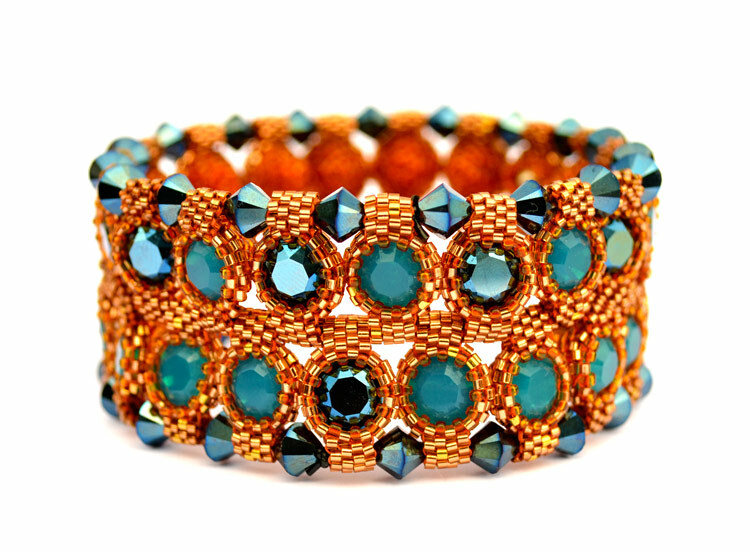 Note: this class uses small size 15 seed and cylinder beads. Note: this popular class is available as a pattern here but this class is more in-depth with multiple demonstrations.